This article describes how to set up S/MIME for exchange accounts using Samsung Email. Open the Samsung email client. Tap More > Settings . Select the required email account. Under Security options, you can enable the Encryption and Signing features. Select the required client certificate. NOTE — If a pop-up screen to set the secure screen lock is displayed, you must first set the device password to continue. NOTE — If the certificate(s) are not installed, you will get an error message stating, certificate not installed. 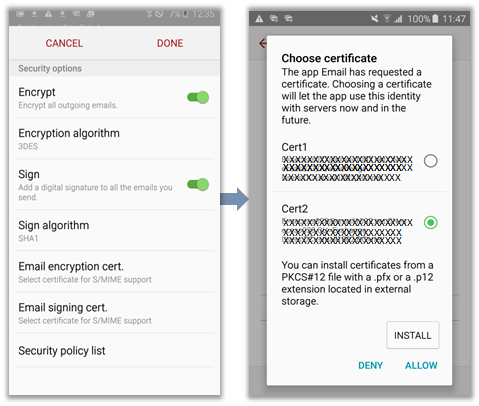 Select the required client certificate and tap Allow if you want to use a certificate which is already installed or tap INSTALL to install new certificates. Alternatively, if you want to apply S/MIME only for a specific email, go to : Message Composer > MORE > Security Options. The Security options dialog box is displayed. 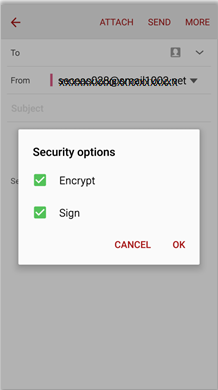 You can select the Encrypt and Sign options based on the requirement.